We've seen some spiffy custom-made figures over time here on the blog, and today adds one more into the mix. 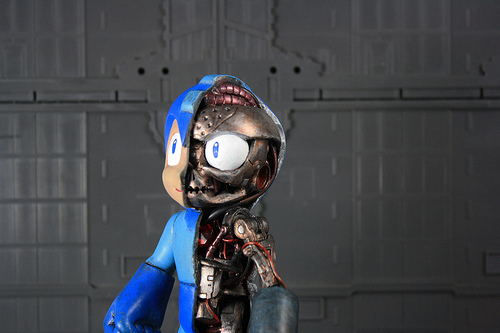 Toy artist KodyKoala, the chap behind creations such as the working Air Man and Guts-Dozer, has fashioned together a cross-section of Mega Man himself -- robot guts and all. 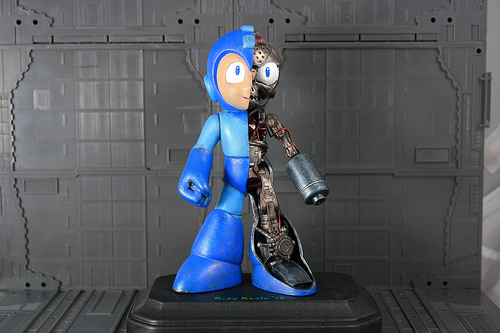 The figure is currently being auctioned off on Ebay, however it's far too pricey for my budget. Interested? Check out the auction here. Of course, for those of us with little to no cash, you can admire more images of the figure at Kody's Flickr page. Now I know what's inside my Mega Man Retro Roto without having to dissect it. XD. Pretty awesome piece though. Very well made. I'll be honest, this looks ugly. Lame... seen it, been done. Though i have to admit it is better than Jazwares piece of s***s.
It looks kinda ogrish.com, i don´t like it! It reminds me the opening of Child's Play 2.